Photos posted to Wu's Weibo social media account in early November, shortly before his death. A video circulating on Chinese social media shows a young man preforming chin ups while hanging from the side of a 62-story building in the city of Changsha — no safety harness, no ropes, nothing. As the film continues, he struggles to pull himself back up onto the roof, as he’s done many times before in dozens of videos. He pauses for a moment, looks down and then falls. 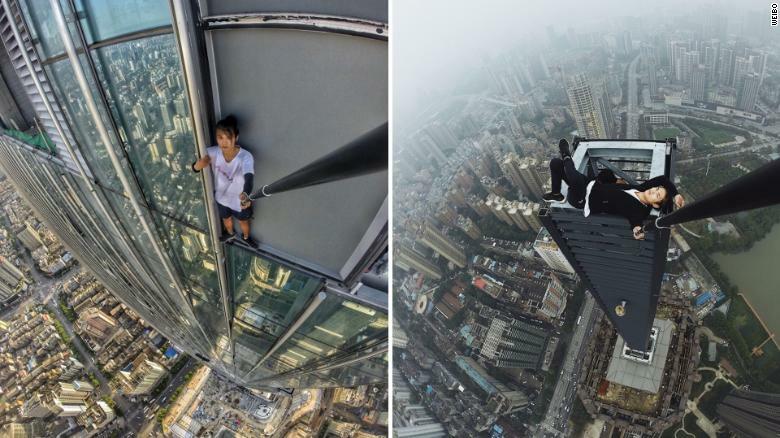 Wu Yongjing, whose nickname on Chinese social media was “the Extreme,” is a casualty of the international daredevil trend known as “rooftopping,” which has taken off across China where a ready prevalence of newly built skyscrapers has combined with a boom in social media apps. Photos posted to Wu’s Weibo account in September and October 2017. In response to Wu’s death on November 8, an editorial in state media China Daily called for greater supervision of livestreaming apps in China. “Had Wu not been so popular on livestreaming apps, he might not have died … Some of them try to hype things up with obscene and dangerous things, and their purpose is to attract more eyeballs and make a profit. It is time we ended this,” the article published on Tuesday said. Not everyone does extreme stunts on the very edge of buildings. Some rooftoppers just like to take photos from stunningly tall, often newly constructed buildings, which they often enter without permission, but others like 26-year-old Wu take things a step further. His previous videos show him hanging off the edge of glistening skyscrapers supported by just his hands. Sometimes he does pull ups. But Chinese rooftopper Claire, who asked us to not to reveal her last name, told CNN she doesn’t just blame Wu’s risk-taking for his death — instead, she says the companies who sponsor rooftoppers are also to blame. “These companies will pay money to the video-makers,” she said, if the rooftoppers will allow that company to advertise on their videos. Claire doesn’t do anything as extreme as Wu, although images on her Instagram account attest to her penchant for danger. Wu’s family were quoted in local Chinese media Beijing News saying he had been offered 100,000 yuan to produce a viral video, which he was going to put towards his wedding. His parents told Chinese media they didn’t know what he was doing. They thought he was trying to become an actor. Rooftopping as a hobby didn’t start in China — it’s been around as part of social media for years. But according to Beijing-based journalist Dominique Wong, it’s only recently become a trend inside China, due in part to the long-term ban on many Western social media sites such as YouTube. “A lot of Chinese people weren’t really being exposed to the idea of it and images depicting it,” said Wong. Claire said she thought China’s rapid economic growth, mixed with the rise of social media, had combined to spark at interest in the risky hobby. “The rise of skyscrapers really served as the soil and foundation of the environment. The spread of social media made success or recognition more attainable, which is tempting for individuals,” she said. Rooftopper Daniel Lau, who spoke about his hobby to CNN in 2015, has 116,000 followers on his Instagram account. Wu’s Weibo account has grown to more than 60,000 followers since his death. “On top of a building you can’t think of anything else, which squeezed out my depression somehow … The thrill is big enough to occupy your mind,” she said. Wong said a lot of the Beijing rooftoppers she has interviewed previously had their interest sparked during a dark time in their lives. “For a lot of them they also find it just thrilling. It’s not always a spiritual thing or a therapeutic thing for all of them. One of the more risky guys, for him it was purely more about the challenge,” she said. A 25-year-old Hong Kong rooftopping photographer, who asked not to be named, told CNN in the wake of Wu’s death some of China’s rooftoppers were likely to reconsider their hobby. “It was sad among the people who are close to this. And it’s kind of a signal to make you think is everything you are doing worth it or not?” he said. The photographer, who is part of the rooftopping community, said he just climbs buildings for the beautiful photos he can take, rather than the thrill factor. “It’s okay if you know you should be careful and responsible when you take pictures, don’t do it as a cool thing to do,” he said. “For some of them, the deaths do really affect them in such a way as it would make them reconsider rooftopping,” she said. For Wong herself the appeal is obvious. “(One of the rooftoppers) asked me to sit on the edge of one of the buildings,” she said. Who is to blame for Chinese rooftopper's dramatic death? Turn it down! Millennials music habit puts their hearing at risk: U.N.